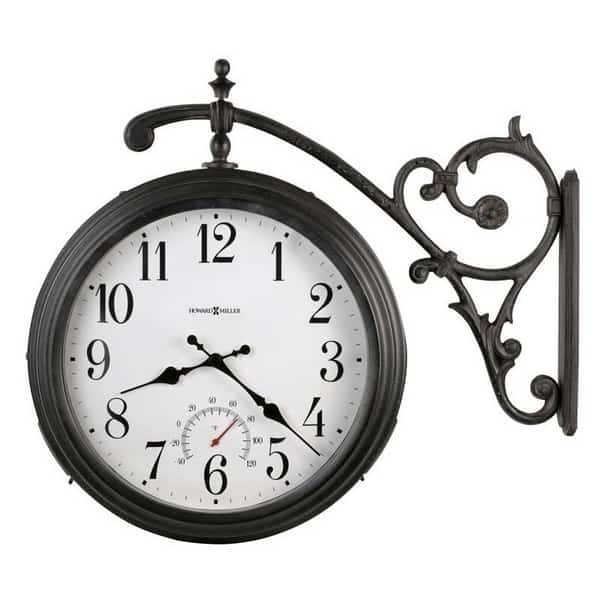 This attractive double sided wall clock is designed for indoor or outdoor use. A thermometer located above the six position indicates the temperature in ºF. The antique iron-finished, powder-coated case is zinc plated and includes stainless steel screws to inhibit rusting. Three rubber seals protect the inside of the clock from inclement weather. The dial, which is off-white with black hour and minute hands, swivels on a decorative wall bracket for optimal viewing from any angle.